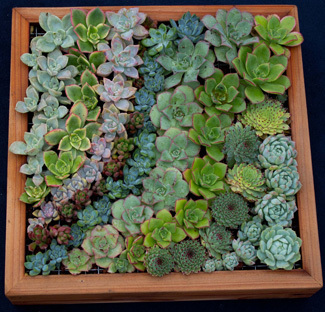 Succulent wreaths and other artistic creations and holiday decorations will be available at the Arboretum sale. Photos by S. McCabe. Wonderful holiday decorations and gifts will be available from the UC Santa Cruz Arboretum at the annual Dried Flower and Succulent Wreath Sale on Saturday and Sunday, November 12 and 13. The sale will be held at the Arboretum's Horticulture Building, and sale hours will be 10 a.m. to 4 p.m. on Saturday and 10 a.m. to 2 p.m. on Sunday. This year, 15 Santa Cruz County artists joined forces with more than 20 Arboretum volunteers to produce some dramatic and creative wreaths and other artwork for the annual sale. There are so many artistic pieces that the Arboretum is hosting an artists' opening from 5 to 7 p.m. on Friday, November 11, as both an art show and a preview for the sale. The Friday preview will allow people to see the wreaths in a leisurely setting, rather than the hectic bustle of the first hour of the sale. Due to expected competition for the most popular items, some of the pieces will be sold in a silent auction on Saturday morning from 10 a.m. to noon. Some artists have already had to fend off buyers during Open Studios. Buyers need not be present to win at the silent auction. Wreaths will be available in styles ranging from delicate to bold, and traditional to avant-garde. In each case, succulents or dried materials from the Arboretum's unusual collections will decorate at least part of the wreaths. With the largest collections of Australian plants outside of Australia and a good collection of South African proteas, there is a lot to choose from. It is also amazing to see the transformation of the Horticulture Building from classroom to stylish shop. The creativity of the volunteers is evident and may inspire visitors to buy plants or dried flowers to make their own creations. There will be ornaments and other items from Norrie's Gift Shop and Nursery at the sale, and customers can go directly to Norrie's to buy jewelry or get a jump on other holiday shopping. 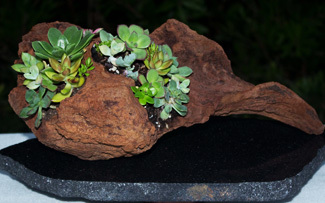 Volunteers have planted succulent frames, novelty designs, and beautiful dish gardens. 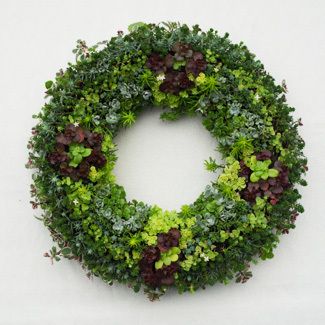 Living wreaths planted with succulents tend to last for three or four years if kept away from the brightest sun and tended like a slow-growing garden. Dried arrangements make lovely indoor decorations for the harvest season and beyond. The sale is a volunteer effort to help the Arboretum's education, conservation, research, and horticulture programs. Most of the profits go directly to fund students working their way through college while learning about horticulture and habitat restoration at the Arboretum. Funds also pay for training UCSC interns.